We’re all familiar with the horizon. Informally, the horizon is as far as you can see, where the sky apparently meets the ground. The horizon of the Earth will come up in several of the proofs we’ll be looking at, but today we’ll be looking at one specific property of the horizon. Firstly, we need to define our terms more precisely, and recognise that there are three different types of horizon. For the first type, the horizon is defined by a plane perpendicular to the direction of up and down. Up and down are defined by the direction of gravity. 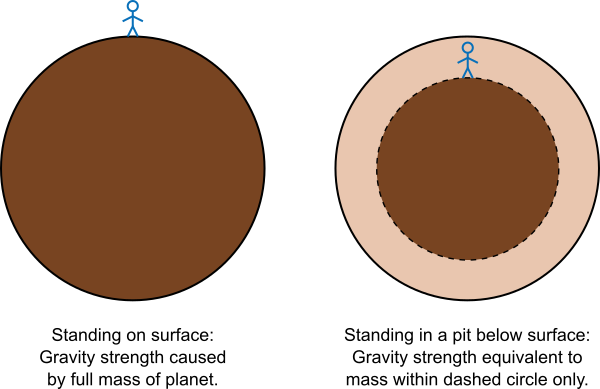 If we’re standing on the surface of Earth, then the force of gravity has a specific direction, which we call down. Now look exactly perpendicular to this direction. You can spin on the spot, looking perpendicular to the down direction at all times. This defines a horizontal plane; indeed the very word “horizontal” is derived from “horizon”. This horizon you are looking at is called the astronomical horizon. It might also sensibly be called the geometric or mathematical horizon. Now let’s define the horizon in a different way. Imagine standing on the surface of the Earth, in a relatively flat area such as an open plain, or perhaps looking out to sea. Look in the direction of the apparent line where the sky meets the Earth’s surface. This is what most people usually think of when they think of “the horizon”, and this is called the true horizon. A third type of horizon occurs when you’re standing in a place where the landscape is not particularly flat. The true horizon might be obscured by mountains or trees or buildings or whatever. In this case, as far as you can see is called the visible horizon. If the visible horizon obscures the true horizon, then the obstructions need to be projecting above the notionally smooth surface of the Earth, so the visible horizon must be higher and closer than the true horizon (or at the same place as the true horizon if there are no obstructions). The three types of horizon. Let’s think about the case where there are minimal obstructions and the visible horizon is more or less the same as the true horizon. Now the question arises: Is the true horizon the same as the astronomical horizon, or different? If the Earth is flat, the astronomical horizon is a plane parallel to the (flat) ground, at the height of the human observer’s eyes. The true horizon is the plane of the Earth itself. These two planes run parallel and, by the laws of perspective, appear to converge at infinity. So if you look horizontally (i.e. in the direction of the astronomical horizon), you will see the true horizon in the same direction. On the other hand, if the Earth is spherical, the Earth’s surface curves downwards, away from the plane of the astronomical horizon. So there should be a non-zero angle between the directions of the astronomical and true horizons. This angle is called the dip angle of the horizon. For a person standing on the ground, this angle is very small and mostly imperceptible. 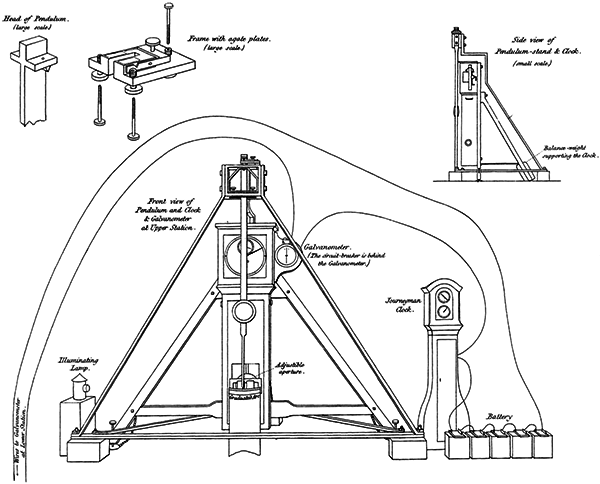 But you can measure the dip angle with a surveyor’s theodolite or its less technological predecessor, an astrolabe. And as your elevation increases, the dip angle increases as well. If you make these measurements with an instrument, you can verify that the dip angle is non-zero, and that it increases with the elevation of your observing position. The 11th century Persian scholar Abū Rayḥān Muḥammad ibn Aḥmad Al-Bīrūnī (usually known in English as Al-Biruni) recognised all of this, and what’s more he realised that by measuring the dip angle of the horizon from a known elevation he could do the geometry and calculate the circumference of the Earth. Eratosthenes beat him to it, but Al-Biruni’s method was arguably more clever, and could be done without needing measurements at different cities. First, Al-Biruni measured the height of a mountain near where he lived. 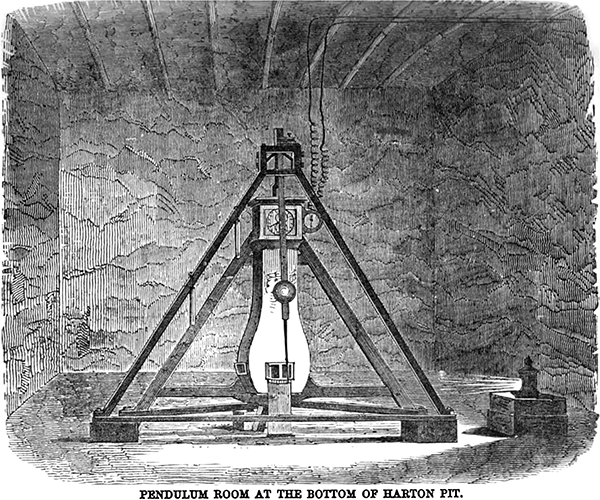 He did this by sighting two elevation angles to the top of the mountain from different distances, and solving the geometry to get the height. Then he climbed the mountain and measured the dip angle of the horizon. From the height, the dip angle, and some basic geometry, Al-Biruni could calculate the circumference of the Earth. 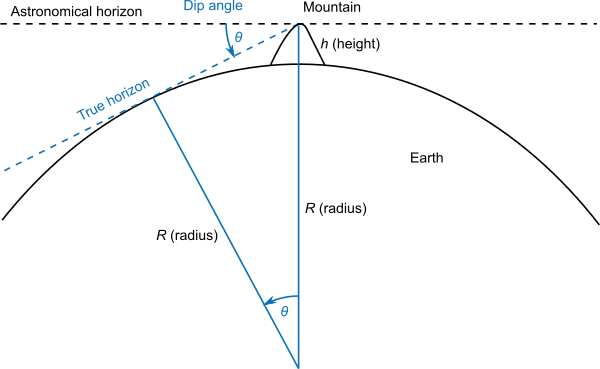 Horizon dip angle and relation to the Earth’s radius. 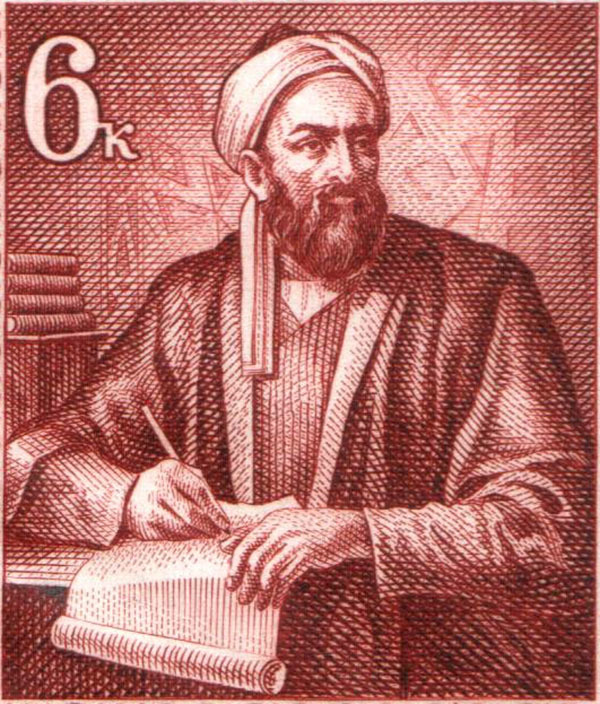 How close did Al-Biruni get? Here’s where things get a little fuzzy. 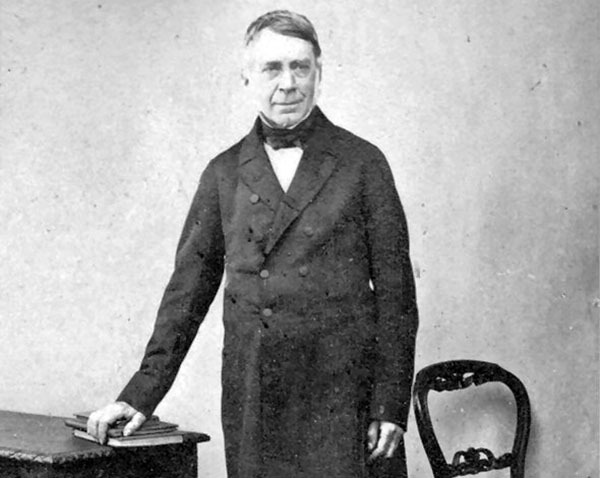 There are claims that he got the correct answer to within about 20 kilometres, significantly more accurate than Eratosthenes’ measurement. But these claims are disputed, partly for reasons similar to Eratosthenes’ result: nobody seems to be sure of the conversion factor from Persian cubits to modern units of distance. There are also claims that atmospheric refraction effects in the hot Persian desert would make measuring the angle correctly difficult, if not impossible. What is the truth here? At this point far removed in history it seems almost impossible to tell. Did Al-Biruni even make the actual measurement? This raises a question about how much we trust historical accounts of scientific activities and experiments. In the case of Eratosthenes, we have multiple sources that agree on what he did, and the tradition of written literature from the Classical Greek period to the present day is more or less continuous and argued by scholars to be mostly reliable. For Al-Biruni, the evidence is less clear. However, whether or not these historical figures actually made the measurements they are credited with is much less important for science than it is for history. History is the study of what happened in our past. Due to incomplete or unreliable record keeping, history can, alas, be lost. Science, in contrast, is the study of the universe and the laws of nature. Scientific experiments, by their very nature, are repeatable. Even if Eratosthenes or Al-Biruni never made the measurements, we can reproduce the methods and come up with the same answers (to within the care and accuracy of our experiments). What does seem reasonably certain is that Al-Biruni did the geometry, providing us with another method of demonstrating that the Earth is not flat. We don’t have to take anyone’s word for it that he did the experiment and showed that the Earth is spherical, because we can do it ourselves. There are a couple of ways of doing this experiment. The traditional way is with a theodolite. 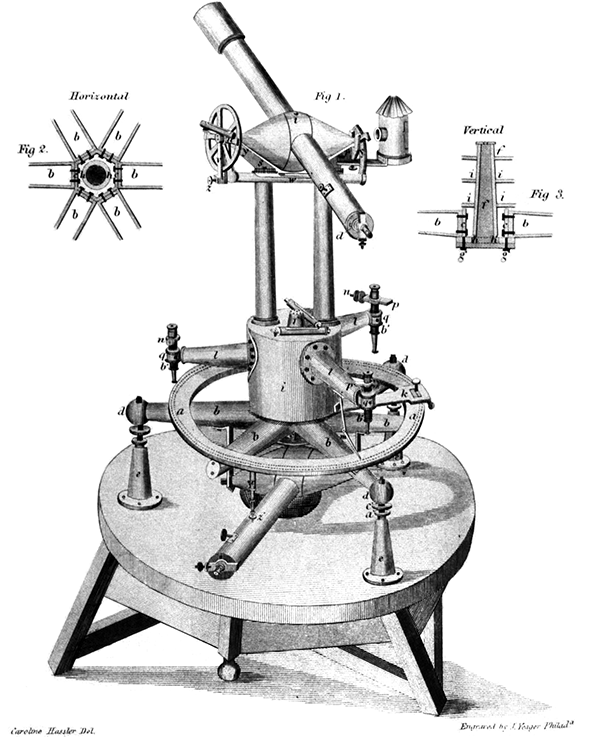 Surveying theodolites have an accurate levelling mechanism. Once the level is set, the theodolite can measure the vertical angle to any object you sight through the telescope eyepiece. Just sight the line of the horizon and read off the dip angle. If you don’t happen to have a theodolite, there are smartphone apps available that use the phone’s GPS and inclinometer systems to provide navigation or surveying aids, including an artificial horizon indicator. The phone’s inclinometer measures the direction of gravity, so the app can easily plot the astronomical horizon. This is displayed on your phone screen, overlaid on a photo from the phone’s camera. If you calibrate and check the app at sea level, you can see that the astronomical horizon is very close to the true horizon – the angle between them is too small to notice or measure easily. But on a mountain or on a flight, you can capture a photo of the horizon—where the ground or layers of clouds below you meet the blue sky‒overlaid with the artificial astronomical horizon. You can see the angle between them and measure it with the app. And if you know your altitude, which you can also get from the GPS reading on the app, or by checking in-flight data, you can calculate the circumference of the Earth yourself. In theory. In practice there are a few complicating factors. The inclinometers in phones are not especially accurate and can be thrown out by forces in flight when turning or changing altitude. And the Earth’s atmosphere refracts light, so sighting very distant objects can give inaccurate angles. So although you can see that the true horizon is lower than the astronomical horizon, calculating the Earth’s circumference in this way can easily give an incorrect value. What this teaches us is that when doing scientific experiments, we have to be aware of any factors that can bias our measurements, and try to eliminate them or correct for them. This is a common theme through the history of science: Not only does our understanding grow, but our ability to understand and correct for complicating factors becomes more sophisticated as well. Since it’s going to come up a lot and be a potential point of discussion on pretty much every post I make here, I’ve written a page (linked in the sidebar navigation) on The nature of proof. It discusses the semantics of what we mean by “proof” in a scientific context. TL;DR: Each proof I post isn’t meant to be stand-alone, irrefutable, ironclad evidence of absolute truth that the Earth is a globe. What they are, are experiments and observations that are consistent with a spherical Earth, and more or less inconsistent with a straightforward Flat Earth model. You might be able to make them fit a Flat Earth model with some ad-hoc tweaking or conspiracy theories – but overall the spherical Earth model is a much simpler explanation. Meteors are small interplanetary objects that cause visible streaks of light in the sky when they collide with the Earth’s atmosphere. Before this visible collision, the object in space is called a meteoroid, and if any pieces of the object survive to land on the surface of Earth they are called meteorites. Meteoroids are considered to range from roughly the size of a peppercorn up to about a metre across. Larger objects are generally called asteroids, while smaller ones are micrometeoroids or space dust. Most meteoroids are made of various types of rock, but a small percentage are mostly iron or iron-nickel alloy, and a few are icy. There are vast numbers of these objects in orbit around the sun, and many million enter the Earth’s atmosphere every day, although only a small fraction of those are large enough to produce a meteor trail visible to the human eye. Meteoroids originate from the asteroid belt, or as broken off parts of comets. These small objects are very easily perturbed by the gravity of large objects in the solar system, which effectively randomises their orbits. So in any region of the solar system, the positions and velocities of meteoroids is more or less random. 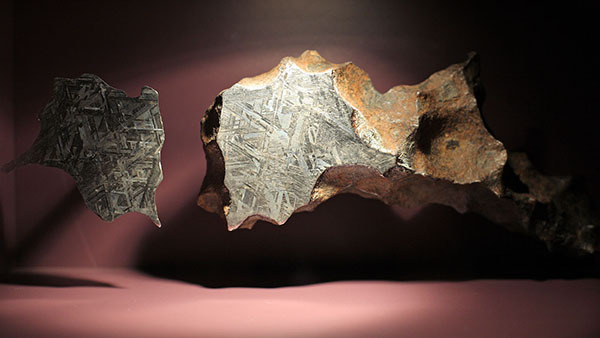 One of the Henbury Meteorites, cut to show iron composition. From an observation point on Earth, we can watch for meteors. Better than counting by eye, we have built specialised radar systems that can detect meteors with greater sensitivity, including during daylight hours, and we can set them up counting meteors all day, every day. Every time the radar detects a meteor, it can record where in the sky it was, what direction it moved, and what time the event occurred. Thinking about the time in particular, we can count how many meteors arrive during any given hour, and average this over many days to produce an hourly rate of meteor events. Many experiments do just this. Let’s consider what time of day meteors arrive, and if the hourly rate of meteors is the same at all times, or if it varies with time. If the Earth were flat, how might we expect the hourly rate of meteors to behave? Is there any reason to think that the hourly rate of meteors might be different at, say, 8pm, compared to 4am? Or midnight? If the Earth is flat, then… meterors should probably arrive at the same rate all the time. There’s no obvious reason to think it might vary at all. Hourly meteor arrival rate at Esrange Space Centre, Sweden. Figure reproduced from . These graphs show the average number of meteors observed arriving during each hour of the day as observed by a meteor-detecting radar station at the Esrange Space Centre near Kiruna in Sweden. The numbers on the vertical axis are normalised so that the 24 hourly bins add up to 1. As shown earlier in the paper, the total number of meteors observed per day is roughly 2000 to 5000, for an overall average of approximately 150 per hour. The times on the horizontal axis are in Universal Time, but Sweden’s time zone is UTC+1, so local midnight occurs at 23 on the graph. Notice that the number of meteors observed per hour is not constant throughout the day, but varies in a systematic pattern. Hmmm. Hourly meteor arrival rate at stations in southern USA. Figure reproduced from . This shows the hourly arrival rate of meteors for a single day as recorded by the American Meteor Society Radiometer Project stations in the southern USA. Again, the times shown are UTC, but the time zone is UTC-6, so local midnight occurs at 6 on the graph. Hourly meteor arrival rate at three SKiYMET stations. Figures reproduced from . 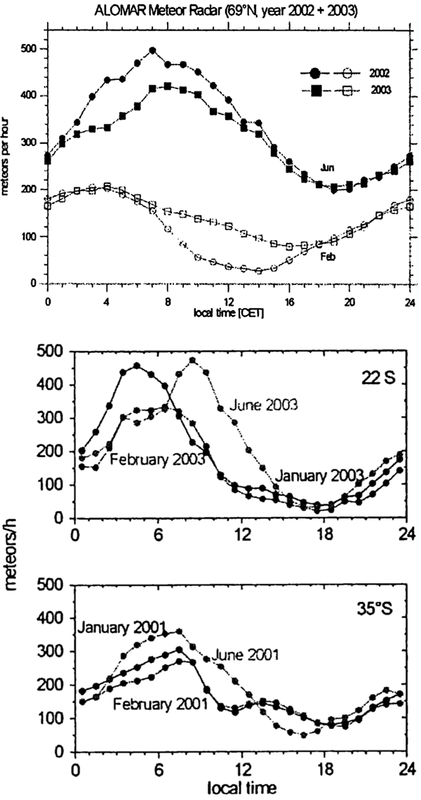 These plots show the hourly arrival rate of meteors at three separate SKiYMET meteor observation sites, at latitudes 69°N, 22°S, and 35°S respectively. The times shown on the horizontal axis here are all local times. Now, notice how in all of these graphs that the hourly arrival rate of meteors varies by time of day. In particular, in every case there is a maximum in the arrival rate at around 6am local time (to within 2 or 3 hours), and a minimum at around 6pm local time. This pattern, once you notice it, is striking. What could be the cause? The Earth is moving in its orbit about the sun. In other words, it is sweeping through space, in an almost circular path around the sun. Now, remember that the distribution of meteoroid locations and velocities in space is essentially random. If the Earth is moving through this random scattering of meteoroids, it should sweep up more meteors on the side of the planet that is moving forwards, and fewer on the side that is trailing. And the Earth is also rotating about its axis, this rotation being what causes the daily variation of night and day – in other words the times of the day. Diagram showing movement of Earth in its orbit and rotation. 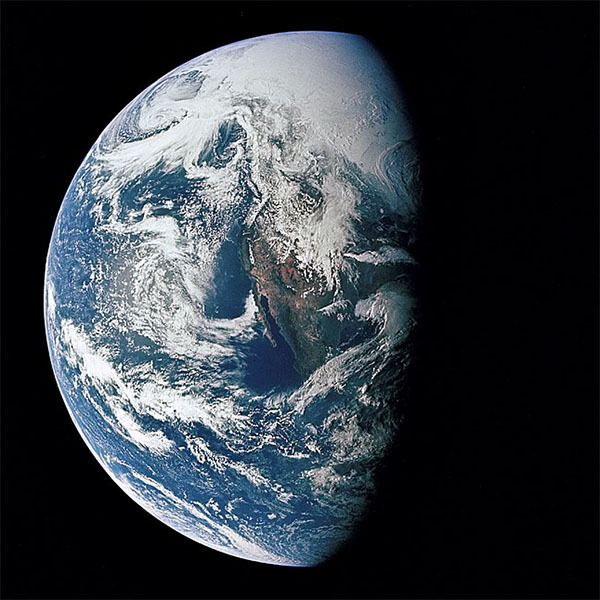 Earth image is public domain from NASA. The side of the Earth that is moving forwards is the side where the rotation of the Earth is bringing the dark part of the Earth into the light of the sun, at the dawn of a new day. We call this the dawn terminator. In terms of the clock and time zones, this part of the Earth has a time around 6am. The trailing side of the Earth is the sunset terminator, with a time around 6pm. There will be some variation, up to a couple of hours or so at moderate latitudes, caused by the seasons (the effect of the tilt in the Earth’s rotation axis relative to its orbit). 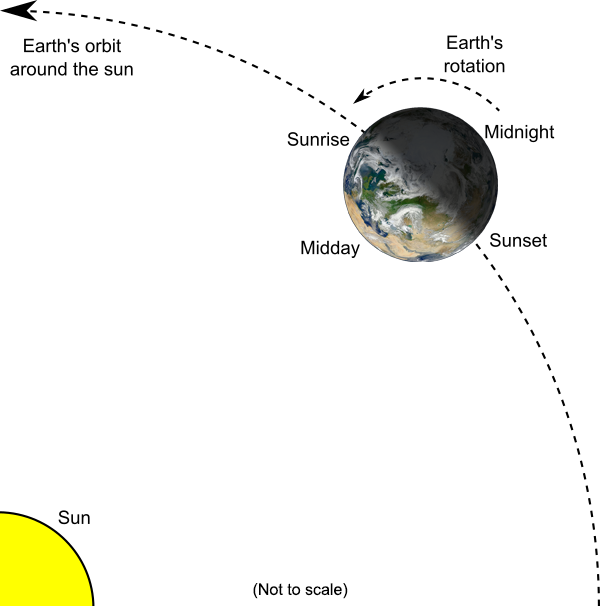 In other words, if the Earth is a rotating sphere in space, orbiting around the sun, we should expect that the dawn part of the Earth, where the local time is around 6am, should sweep up more meteors than the sunset part of the Earth, where the local time is around 6pm. And if the Earth is a sphere, this variation should be sinusoidal – the distinctive smooth shape of a wave as traced out by points rotating around a circle. And this is exactly what we see. The variation in the hourly arrival rate of meteors, as observed all across the Earth, matches the prediction you would make if the Earth was a globe. One consequence of the Earth being a globe is that if you want to see meteors – other than during one of the regular annual meteor showers – it’s much better to get up before dawn than to stay up late. Determining that the Earth is not flat is not a feat that requires space age technology to achieve. In fact, you can demonstrate it with not much more than a stick and some elementary geometry. And this was indeed done in antiquity. Around the year 240 BC the Greek scholar Eratosthenes realised the significance of certain observations based on shadows cast by the sun. Not only did he show that the Earth is not flat, he did an experiment to measure the circumference of the spherical Earth. 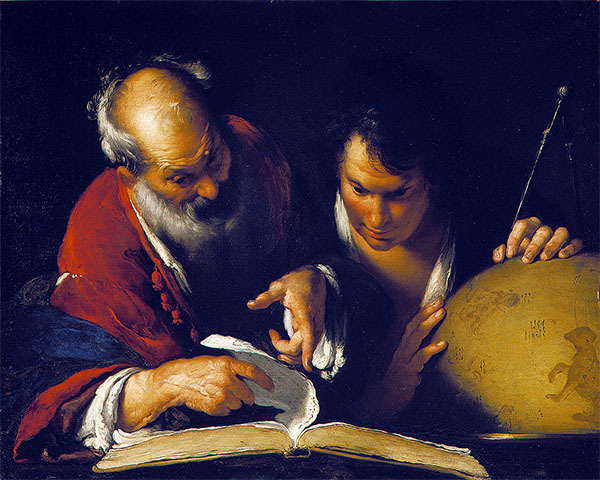 Eratosthenes was the head librarian at the great Library of Alexandria. He had heard that at noon on the day of the summer solstice, the sun shone directly down a vertical well in the Egyptian city of Syene, where the modern city of Aswan now stands. Equivalently, at noon on the solstice, a stick placed vertically in the ground would cast no shadow, because the sun was directly overhead. This property was well known amongst geographers as a curiosity, because it didn’t happen at any cities further north. Eratosthenes took it a step further by thinking about why this was the case. 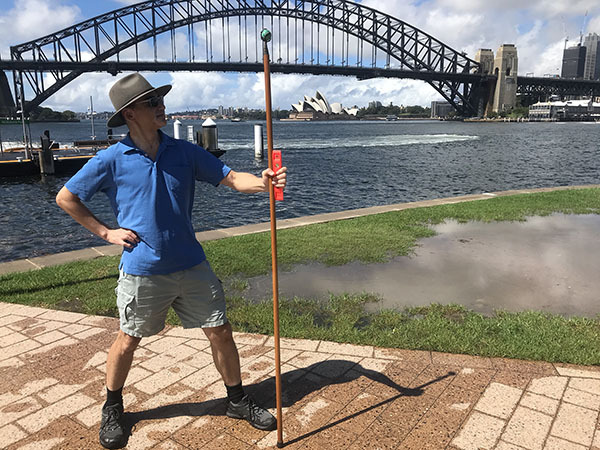 He figured that the sun was a very long way away, at least much further away than, say, the distance between Syene and Alexandria on the northern coast of Egypt – measured by surveyors to be 5000 stadia. (According to the writings of Eusebius of Caesarea, Eratosthenes in fact calculated the distance from the Earth to the sun, possibly using a method developed by Aristarchus. Eusebius’s figures are ambiguous, but can be interpreted as giving a figure of 149 million km, almost exactly correct.) If the Earth were flat, the sun would be directly overhead everywhere at the same time. But this was not the case. At noon on the summer solstice, a vertical stick in Alexandria cast a definite shadow. 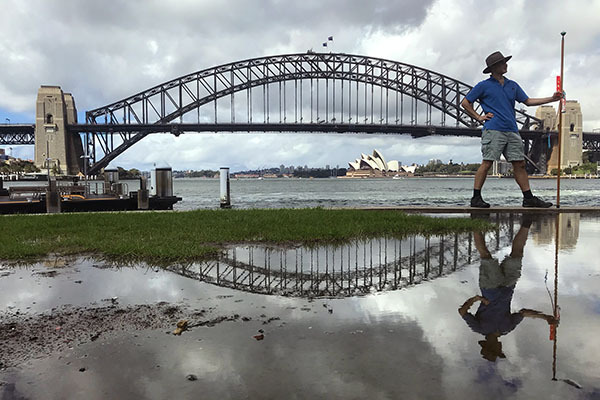 He realised not only that the Earth’s surface must be curved, but that he could use the length of the shadow to calculate how big the Earth was. By measuring the length of a vertical stick and its shadow in Alexandria at noon on the solstice, Eratosthenes calculated that the sun was at an elevation of 7°12′ to the vertical. The angle of 7°12′ is exactly one fiftieth of a circle. Eratosthenes also figured that Alexandria was pretty much due north of Syene. So this meant that the distance from Syene to Alexandria must be one fiftieth of the circumference of the Earth. So the circumference of the Earth, Eratosthenes concluded, must be 250,000 stadia. 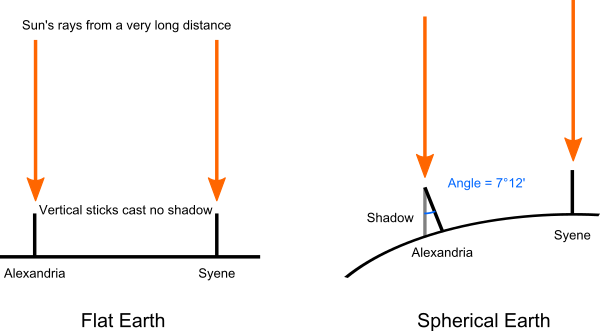 Shadows in Syene and Alexandria, if the Earth were flat, or spherical. How long is a classical Greek/Egyptian stadion? There is some debate over this. Some scholars suggest that Egyptian surveyors used a stadion of 174.6 metres, giving a circumference of 43,650 km. Others think they used a stadion of 184.8 m, giving a result of 46,000 km. Modern measurements of the Earth’s circumference around the poles set the figure at 40,008 km. So depending which figure we use for the stadion, Eratosthenes got the answer right to within 9% or 15%, respectively. Not too bad for a measurement made with nothing but a stick! The main mistake Eratosthenes made was assuming Alexandria was due north of Syene. The distance needs to be adjusted to remove the east-west offset, and if you do this you get an answer even closer to the modern measurement. The rest of the error is likely mostly due to imprecision in measuring distances and angles. We might even speculate that Eratosthenes did a bit of rounding to make his measured angle exactly one fiftieth of a circle. Work out the date closest to the equinox where you are. For time zones of UTC+2 or less (including all of the Americas, Europe, and most of Africa) it’s on 20 March, 2019. For time zones UTC+3 or more (including Eastern Africa, Asia, Australia) it’s on 21 March. Actually if you’re in Europe or Africa, the equinox is close to midnight this year, so it probably doesn’t matter much if you do this on 20 or 21 March. Work out what time is local solar noon where you are. (This is the time when the sun is directly over the meridian of longitude running through your location, and it’s usually not exactly at 12:00.) For this, use TimeandDate.com’s Sun Calculator. Enter your location in the search box. When the page brings up the data for your location, scroll down to the calendar table and find the entry for the date you have worked out at step 1. Look at the column marked “Solar noon” and read the time given there. You now have the date and the exact time when you need to make your measurement. Hopefully it will be sunny for you then! Work out where you’ll be at that time on that date. Find a nice flat, level area there. Get a straight stick – the longer the more accurate. Measure the length of the stick. On the equinox date, at the exact time of your local solar noon: If it’s sunny, place your stick vertically on your flat area. Do this as accurately as you can – use a spirit level or inclinometer if you can. If you don’t have one, let the stick dangle from the top, with the bottom just barely touching the ground. With the stick vertical, measure the length of its shadow cast by the sun, again as accurately as you can manage. Using a friend to help you will make things easier. If it’s not sunny at the right time, oh well, I appreciate your help anyway, but that’s how science works sometimes! Once you have the shadow length, you’re ready to report your data! I need to know: (1) Where you were – city, state, country – enough that I don’t get it wrong. If you can tell me your exact latitude (using Google maps or a GPS), even better. (2) The length of your vertical stick. (3) The length of the shadow you measured. Send these three bits of data to me by email [dmm at dangermouse.net], by the end of March. I’ll calculate the results, do some statistics, and come up with our very own measurement of the circumference of the Earth! I’ll post the results here in April. The most straightforward way to check the shape of the Earth is to look at it. There’s one small problem, though. To see the shape of the Earth as a whole, you need to be far enough away from it. For most of human history, this has not been possible. It was only with the advent of the space age that our technology has allowed us to send a human being, or a camera, more than a few kilometres from the surface. 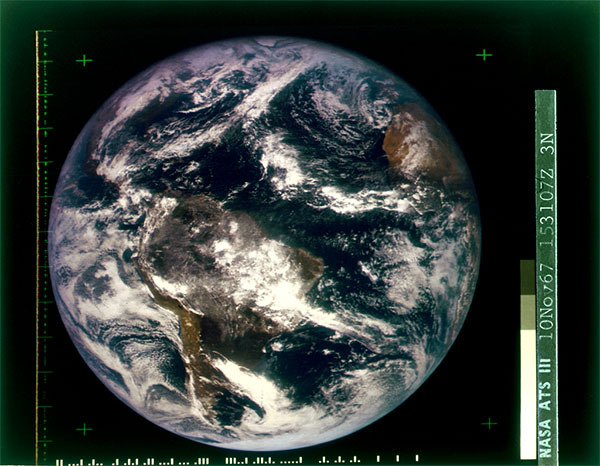 The earliest photo of the whole Earth from space was taken by NASA’s ATS-3 weather and communications satellite in 1967. The photo was taken from geostationary orbit, some 34,000 kilometres above the surface of the Earth, and shows most of the western hemisphere, with South America most prominent. And you can see quite clearly that the Earth is round. It looks spherical, for the other landmasses that we know are there are hidden around the other side, and there is foreshortening of the features near the edges which matches our experience with spherical objects. 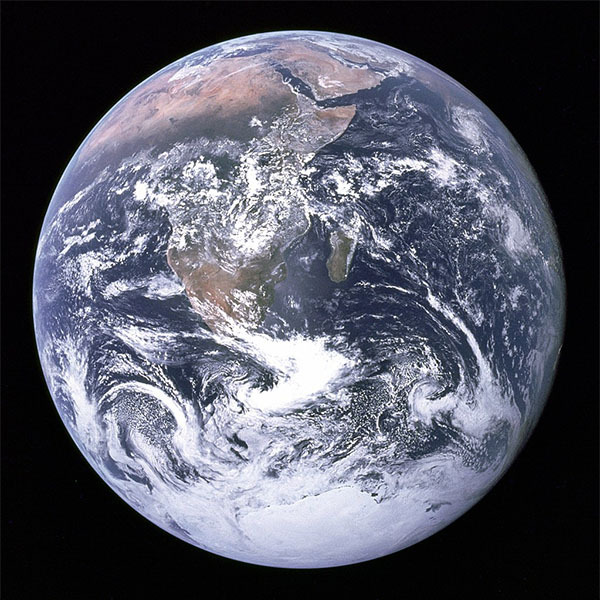 A more famous image of Earth taken from space is the Blue Marble image, captured by the Apollo 17 astronauts on their way to the Moon in 1972. This photo was taken from a distance of about 45,000 kilometres. This image is clearer and it’s arguably easier to see the spherical shape of the planet. Both these photos were taken with the full hemisphere lit by the sun. The Apollo 13 astronauts, in their ill-fated flight, captured a different view, with part of the Earth in darkness because the sun was not behind them. Here it is even easier to get a feeling for the round, spherical shape of Earth, because our experience with the way light falls on round objects helps our minds make sense of the curved shadow. Well, that’s pretty definitive. But what else do we have?